Navigating in a 36 or 20 passenger Luxury expedition. Ervery date have diferent programs, ask your exact program ! With a European design and modern shape offers more space, comfort safe security for and a naturalist cruise. 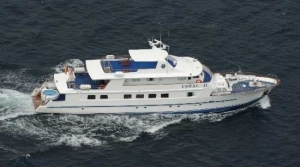 It is an attractive and functional mid-size (Mega yacht), perfect for an intimate experience when cruising the islands. Some cabins are connecting, jus for families and special groups. 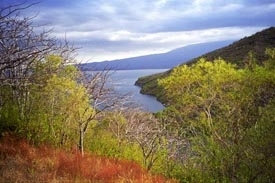 The Galápagos Islands, where Charles Darwin developed his famous theory, a land of Legends. The secret is isolation,the advantage of being in the middle of nowhere has allowed animals, fish and plants adapt and change forming new species. Share the Legend where animals do not fear man, see the Giant Tortoises and blue footed boobies, walk inside lava tubes and swim safely among sharks and sea lions. It has eighteen spacious cabins decorated with a marine taste. 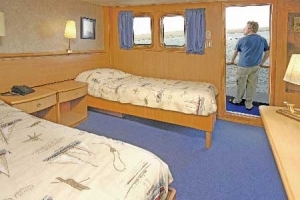 There is plenty of room for storage, and moreover, all beds in all cabins are lower and they can be arranged as matrimonial, as well as single and double beds. Each cabin has their own private facilities, hot and cold shower with a fresh and lasting supply of water. The Coral II is a landmark 11-cabin yacht, styled in an era of eye-catching design, a beautiful blend of form and function. She boasts romantic and cozy living areas, intimate and modish dining, sleek and seductive outside decks. 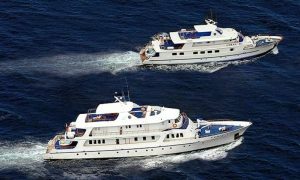 Her amenities and outstanding service make her the ideal yacht for experiencing the marvels of the islands. The M/Y Coral II accommodates 20 passengers, ideal for those who want to discover the islands with privacy, intimacy and supreme comfort. Her excellent cruising speed means more time for visiting the islands and enjoying activities, while her small size means less time organizing shore visits. land birds. The Darwin Station also works providing environmental education to communities and schools within the islands, and to tourists visiting the Galapagos Islands. You will also have some free time to visit the town and shop for souvenirs. Wet landing on an olivine green sand beach. We hike from the black mangrove beds to a brackish lagoon, which usually holds one of the largest flamingo populations in the Galapagos. This island features some endemic plants such as Scalesia villosa, white and black mangrove, and holy stick. The trail continues to a beautiful white-sand beach, one of the most important nesting sites of Green Pacific Sea Turtles. It is important to avoid walking in the water due to the Sting Rays that may be hiding in the sand, which can be dangerous if accidentally stepped on. From the beach one can spot sea turtles, Blue-footed Boobies plunging into the water, and small reef sharks floating along the shoreline in search of food. This coral-sand beach marks the end of our trail, and we head back to the olivine beach we landed on to swim or snorkel amongst sea turtles, reef fish, sea lions and, on a good day, white-tipped reef sharks. A small colony of penguins resides on Floreana and can sometimes be observed as well. – PM – Post Office (Floreana) Wet landing. Located on the north side of Floreana, the bay is so-named because in 1793 Captain James Colnett installed a wooden barrel which served as an informal post office for sailors passing through, who would take letters with them to their destinations. Today, our visitors continue the tradition by placing unstamped postcards inside the barrel that should reach their destinations for free. It can take weeks, months, even years, not arrive at all, or even arrive before you! We may also encounter Darwin’s finches, Yellow Warbler and lava lizards. Great snorkeling opportunities with Green Pacific Sea Turtles as well, this island is best known for its endemic vegetation: Scalesia villosa, Lecocarpus pinnatifidus, and Galapagos milkwort. 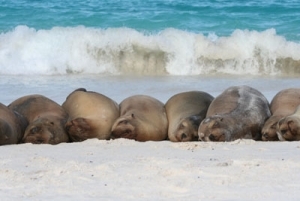 Snorkelers can practice on the main beach among playful sea lions. of Galapagos marine animals: King Angelfish, Creole Fish, Damsel Fish, parrot fish, manta rays, and White-tipped Reef Sharks. Galapagos Dove, Galapagos Hawk, Swallow-tailed Gulls and the world’s largest colony of Waved Albatross, an unequivocal highlight during mating season (May-December). Admire the island’s dramatic backdrop, featuring the famous Soplador, a seaward blowhole that shoots water at some 23 m. (75 ft.) in the air. Ask us the 5 days program ! 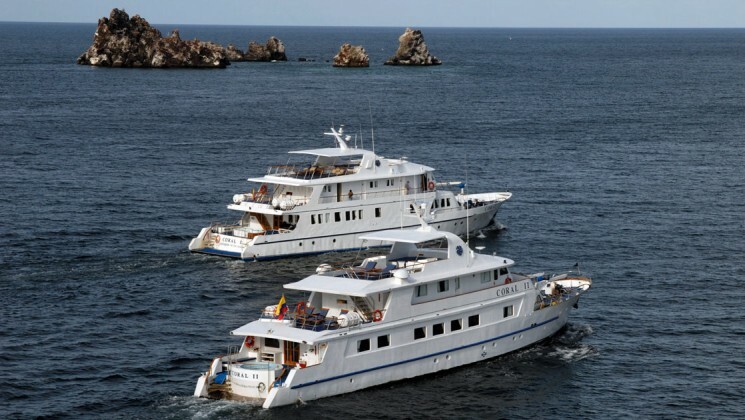 All meals during the M/Y CORAL 2 Galapagos cruise vacation package, guided shore excursions and lectures, hosted by multilingual, experienced, naturalist guides, as well as transfers to/from the yacht in Baltra/the Galapagos. Note: Incidentals/extras are not included in the Galapagos cruise rate(s) and must be paid directly by the passenger(s). 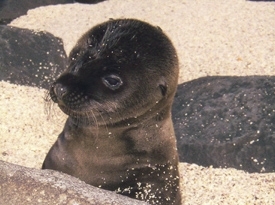 All Galapagos cruise vacation packages and tour itineraries are subject to change at any time without notice. Round trip international airfares between the USA or any other country and Quito or Guayaquil, Ecuador, are not included in the Galapagos cruise rates shown above and must be purchased and paid for separately by the passenger(s). 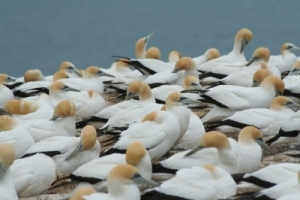 Also not included is the local Galapagos airfare from Quito or Guayaquil to/from Baltra. 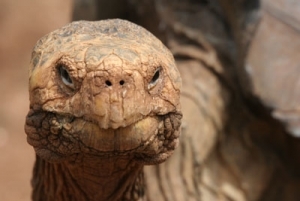 The approximate cost of the round trip Galapagos airfare (these prices are subject to change at any time without notice), between Quito or Guayaquil and Baltra, is $418.00 per person, including Ecuadorian air ticket-related taxes and ticketing fees. This item is quoted and paid for separately by the passenger(s).The cost of tips and general gratuities to the ship’s crew, the captain and the ship’s naturalist guide(s),m are not included and they are at the discretion of the passenger(s), according to the level of service received during the M/Y CORAL 2 cruise. 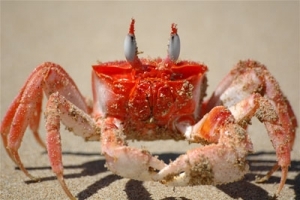 The US$110.00 per person Galapagos National Park tax (subject to change at any time without notice) is not included in the cruise rates shown and must be paid directly by the passenger(s), in US$/cash, upon arrival at the airport in Baltra.